At least I can speak with certainty about the PDOs and PGIs that exist in Croatia, as the EU maintains a list centrally. Croatian PGIs are easy – there are none! Of the PDOs, there is one that covers all of this region, and more, called Srednja i Južna Dalmacija, which translates as Central and South Dalmatia. Judging by the wine labels I have seen, this is quite commonly used, and wines of several different varieties seem to qualify for it. The only other two PDOs that it is clear to me are in South Dalmatia are Dingač and Dalmatinska zagora. Dingač and its sister area of Postup are on the Pelješac Peninsula, and discussed below, while Zagora lies somewhere between Dubrovnik and the peninsula and I know hardly anything else about it. 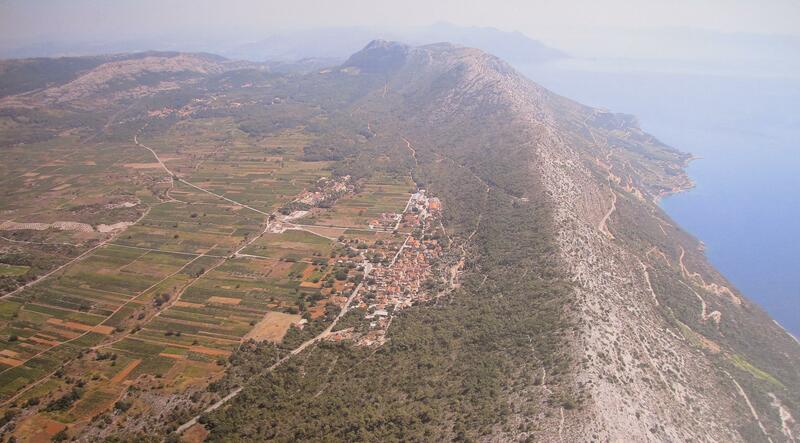 Another major wine-growing area is the island of Korčula, of which I shall presently write a little more. The Konavle Valley also deserves a brief mention. This is in the area around the symbol for Gruda in the map below. I don’t think the Konavle Valley has the same level of status as Pelješac and Korčula, but I have had at least two very good wines from there, and it is now accessible from Dubrovnik as a wine tour, complete with tourist train ride to take you between winery visits. There are also wine tours to the Pelješac Peninsula, which is a bit more of a schlep from Dubrovnik. On wine labels you will additionally find a type of geographical area that is neither PDO or PGI called vinogorje, which could be translated as vineyard but in this usage it is a much larger wine area. I am not sure how strictly regulated these vinogorje names are, but South Dalmatia examples I have seen are Pelješac, Korčula and Konavle. Probably the most important grape in the South Dalmatia is Plavac Mali. It is certainly the most important red variety – if I may presume to call it red that is, as the name translates as little blue one. It is grown principally on the Pelješac Peninsula, the entrance to which is around 40 miles North-West of Dubrovnik. The vineyards of the peninsula are not all of Plavac Mali, and are scattered along most of its length. However there is quite a cluster of producers in and around the village of Potomje, and the flat land just to the North of the village contains what is probably the peninsula’s largest concentration of vineyards. The village, and its vineyards on the plain, can be seen in the image below. Just over the mountain ridge from Potomje, to the right in the image, are the steep South-facing slopes of the Dingač vineyards stretching down to the Adriatic. Dingač was the first protected geographical area in Yugoslavia, achieving this status in 1961. With its South-facing aspect, and possibly with the help of reflected light from the sea, grapes achieve high levels of ripeness and can make particularly powerful and tannic red wines. Dingač seems to be a strong brand – when I was there in Dubrovnik, most wines types seemed to be referred to by grape variety, but Dingač was always Dingač. On the above map, Dingač lies by the top of the “l” in the word “Pelješac”, while Postup is further West, close to the Easternmost end of the island of Korčula. If you check on the Google Maps satellite images you can identify both these vineyard areas, and the ones on the plain around Potomje. While the Pelješac Peninsula is best known for it Plavac Mali, Korčula specialises in white wine. The decision for it to focus on whites was taken by a Yugoslav government committee but that decision has had a lasting influence, even if on the face of it the island’s geography is not too different from that of Pelješac. Special mention should be given to the relatively rare grape variety Grk, which is grown in any quantity only on Korčula, largely at the Eastern tip of the island. However, Pošip is the variety that Korčula is best known for, and Pošip from Korčula is widely available in the region. In summary, the local wines you are most likely to come across in Dubrovnik, or at least the ones I remember best, are Plavac Mali from Pelješac, in particular Dingač if you go a bit upmarket; and the white wines of Korčula, especially Pošip, and the rarer Grk. This entry was posted in General and tagged croatia, dalmatia. Bookmark the permalink. Interesting, Steve, Did you see many wines from inland Croatia, or indeed foreign wines? I didn’t, but it was a while back, and given that Bosnian and Montenegro wines are a fair bit cheaper, it would seem logical that some would find their way in. There were quite a few wines from the rest of Croatia, but I think it is fair to say that Dalmatian wines were favoured. I don’t remember seeing any foreign wines, including those of their neighbours, though I wasn’t particularly looking. It is just my supposition so I am happy to be corrected, but the wars are still quite fresh in people’s memories, and that might still be reflected in a reluctance to trade with Bosnia and Montenegro. wow Croatia has wines too? how does the wines taste like? new world or old world style?